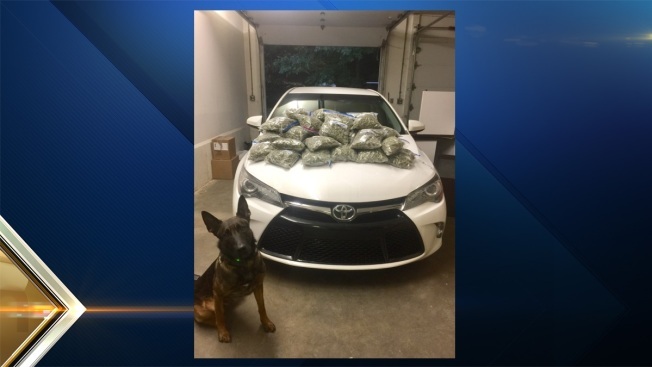 Two people were arrested after a police K9 sniffed out a trunk full of drugs following a motor vehicle stop on Interstate 95 in New Hampshire earlier this week. Around 3 p.m. Tuesday, a New Hampshire State Police trooper pulled over a 2016 Toyota Camry on I-95 south in Portsmouth for motor vehicle violations. The trooper's K9 picked up an odor of drugs inside the vehicle. A search warrant was obtained, and more than 20 pounds of marijuana were found hidden in the trunk. The driver, Joseph Gallagher, 61, and a passenger, Jason Gallagher, 36, both of Waldoboro, Maine were charged with possession of a controlled drug with intent to distribute. They were released on bail and are scheduled to appear in Portsmouth District Court on Dec. 12.